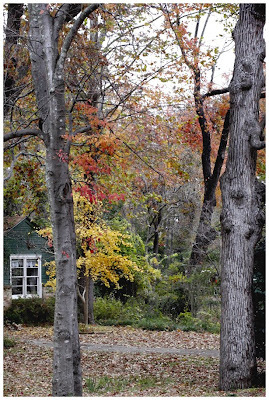 What a sweet little house Mary has, comfortably tucked away in the trees. And there is still some colour lingering on those trees I see! Well, if it is an upward climb this week, be comforted knowing that what goes up, must peacefully float down...I hope! Jaime - Mary's house looks so sweet & cozy in this picture. I almost wanted to photoshop in a fireplace! Just picture a black & white cat in the yard & you have it. And I can already see the top of this steep road, then down I go. I can't wait! Valaine - Thank you, ma'am! It is actually charming if I pay attention to it, and not just whoosh by here & there, on my way to work or to the store. And full of characters! I never would've imagined Mary's house to look so. Wow. 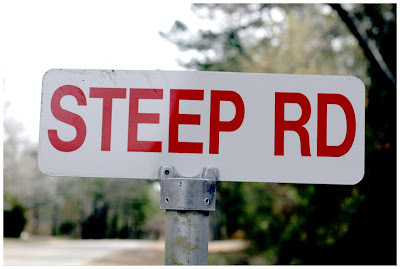 And, the Steep Rd. sign definitely got some chuckles out of me! I love that moss in between the stones! Of course, being the gardening gal I am, I'd see that first and foremost! It's Tuesday evening and the precipitation has begun! Stay warm! Brenda - I fell asleep last night listening to sleet against the windows & this afternoon passed a temperature reading that said 29 degrees. I hate cold weather! :) But I admit the sleet sound was pretty soothing! Robin - December Views is keeping me alive on my blog for a bit. We are just so busy. And I thought I was seeing the end, but no . . . more stuff in today! Oh well, it's Christmas & people want pictures! :) And re: Mary's house. It looks as if it's in the woods, but really it's not. It's right here in town, across the street from me. Of course, it is an old neighborhood with lots of trees & that creek & brick streets. Our neighbor, whose family built the first house in the area, is in his 80s, and lived here when was a child; he can tell a story about a donkey being swallowed up by quicksand just 20 feet from that tree on the right! As for the moss, this is NE Texas - we're less than 100 miles from Louisiana, and it is humid & green. More southern than western. It gets sticky! LOL! I can almost smell the winter air looking at these photos. Lady T - Thank you! 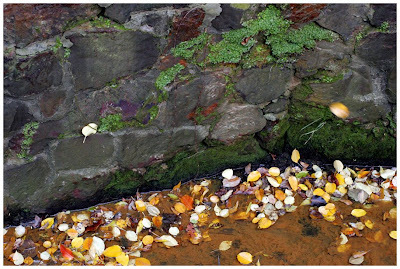 That wonderful little creek can flood when rain comes pouring down, but it's still very cool!